When an automobile fails an emissions test performed by your local auto repair shop, one of the most common causes is a failed catalytic converter. 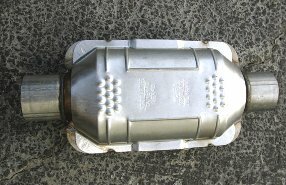 The catalytic converter lowers emission levels by changing harmful pollutants into relatively harmless gases. 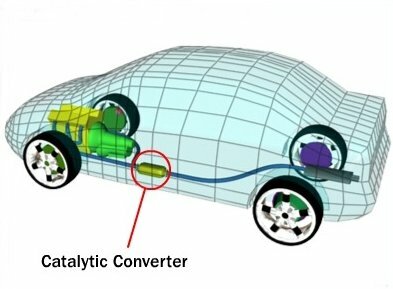 The catalytic converter works by using heat, combined with catalyzing agents, to create a chemical process that changes hydrocarbons (HC) and carbon monoxide (CO) into carbon dioxide and water. Some catalytic converters are designed to reduce an additional pollutant, oxides of nitrogen (NOx), by breaking it down into base components, nitrogen and oxygen. The catalytic converter resembles a muffler and is usually placed in the exhaust system close to the exhaust manifold. This is done to provide more heat to the catalytic converter for faster ignition of the catalyst. Auto repair mechanics will typically perform an exhaust backflow test in order to determine the catalytic converter’s viability. The catalyst consists of pellets or a honeycomb grid, coated with platinum, rhodium, or palladium. The catalyst is placed in a shell, inside the converter and insulation is usually placed around the shell and covered with an outer shield. Because the heat generated inside the catalytic converter can exceed 1400F, heat shields are generally placed between the converter and the floorpan of the vehicle. Troubleshooting and diagnosing lack of power problems will often involve an auto repair mechanic inspecting a clogged catalytic converter. Catalytic converters were required equipment starting in 1975. The first catalytic converter to appear and still in use today, was the oxidation catalyst. The oxidation catalyst targets only HC and CO. It contains catalyst material consisting of platinum and palladium, either in pellet or honeycomb form. When exhaust gas flows through the catalyst and minimum temperatures are reached, a combustion process is started causing oxygen to combine with HC and CO molecules. This process converts HC and CO into water vapor and carbon dioxide. The oxidation catalyst requires a higher than normal exhaust oxygen content to operate, so they are generally used in conjunction with an air pump system. Vehicles that do not use an air pump supply added oxygen to the exhaust system using lean air/fuel mixtures. The dual bed converter first appeared in 1980. It is designed to reduce NOx in addition to converting HC and CO. The dual bed converter is actually two types of catalyst, combined into one unit. The front section targets N Ox and the rear section, an oxidation catalyst, is dedicated to HC and CO conversion. An air supply hose is generally connected to the center of the dual bed catalyst to furnish additional oxygen to the rear oxidation catalyst section. The front NOx reducing catalyst is designed to work in a low oxygen atmosphere so it does not receive an air supply. The NOx reducing section of the converter usually contains rhodium as a catalyst. The catalyst breaks down the NOx into separate base components of nitrogen and oxygen. The remaining exhaust flows downstream into the oxidation section for HC and CO conversion. Better equipped auto repair shops have diagnostic equipment to test such conversion. The three way catalyst works in a similar fashion as the dual bed catalyst, but provides NOx reduction and HC and CO oxidation using a single catalyst. The three way catalyst only operates efficiently when the air/fuel mixture is near 14.7 to 1, so it is generally only used on vehicles with computerized fuel and emission controls. The three way catalyst contains platinum, rhodium or palladium as a catalyzing agent. Some three way catalysts also contain oxygen storage elements such as cerium to aid the catalyst process. The three way catalyst works along with normal rich to lean cycles that occur with the use of oxygen sensor feedback controls. When the exhaust cycle is rich and low in oxygen, the reducing portion of the converter operates to control NOx. When the exhaust cycles back to lean, oxygen levels are high and the oxidation process converts HC and CO to water and carbon dioxide. The three catalysts depend on the constant switching from rich to lean, to operate properly to control all three target emissions. Catalytic converters do not normally wear out. Rather, they are usually subject to failure from external physical damage such as impacts with road debris or internal damage to the catalyst from overheating. Overheating of the catalyst usually occurs from excessively rich fuel mixtures or an engine misfire. When this occurs, raw fuel enters the catalytic converter and is ignited. The result is extremely high temperatures that exceed the melting point of the catalyst components. Therefore, a clogged catalytic converter can usually be traced back to a fuel system problem; any competent auto repair mechanic will take this into consideration. The typical result is a restricted exhaust system from the melting of catalyst material inside the converter. The catalyst material can also become contaminated by silicon or leaded fuel. Whenever a damaged catalytic converter is replaced, the cause of the catalytic converter failure should also be located and corrected. 8 Comments on "Catalytic Converter"
I heard rattling noise coming from the catalytic converter unit (2 cats) within a month of installing it. I sent the unit back to the manufacturer and they deducted that the blocks were melted and the warranty was voided. I cut the cats open and found no sign of melting and one block loose causing the rattling. The block insulating material had blown out from around the block. The other 3 blocks were solid in each cat. Is the manufacturer responsible? He welds the cats (supplied) and pipes together. He says he is not responsible for his supplier problems. What say you? I have problem with my catalytic converter I took my truck to jiffy lube on 3-9-12 for a tune up fuel system cleaning service full throttle fi cleaner engine system cleaning after done the check engine light was on never had it on before I took the truck back to them they said take it to the dealer to reset the light or they have a code dealer ask me if it had a system cleaning or engine cleaning I said yes they told me they brake the 2 catalytic convertes I took the truck back they said is not true what did u think it happen? First, allow me to thank you for a succinct, however complete, explanation of catalytic converters. I feel that I can confidently discuss this matter with the representatives of my service center because of your effort to inform me/us. Our situation is as follows. My wife stopped at our usual gas station and filled up our 2002 Honda Accord, original owners, on her way back from work last night–no problems incurred. This morning, as she attempted to leave the driveway, the car was sluggish–wouldn’t go actually, and the tail pipe emitted a voluminous amount of smoke which smelled like sulfur, the typical rotten egg-smell. At first, we thought it might be due to bad gasoline but a friend suggested that it might be due to the Honda’s catalytic converter. A phone call to our Honda dealership revealed that the cat-con was likely the reason but would need to be investigated. The cost to just look at the car is $100 and if a repair is made that charge is waived. The cost to replace a cat-con would run $700 to $1,500. Wow. I will attempt to drive it to the dealership (4.5 miles) and will be prepared to call for a tow-truck should the car refuse to make it that short distance. Again, thanks for your well-written article. the smog guy told me the original location for my cat is behind the muffler as in closer to the back bumper further from the motor than the muffler.1991 c3500 454 cu.in. Curt, the smog guy who told you the cat conv is downstream of the muffler is an idiot. Converters are put as close to the exhaust manifolds as possible for faster light off. The only benefit from putting the converter aft of the muffler is to reduce back pressure. Instead of the exhaust shock waves slamming into the converter, it goes to the muffler. The ample space of the muffler evens out the exhaust pulses and enables a smoother gas flow through the converter. It will take a long time before the converter gets hot enough to light off though. The only reason for that is to maintain appearances to show that a converter is there at all. we have a customer that has a 99 Saab turbo, the customer complains about excessive smoke from the tail pipe. we have determined it is water vapor. The last smog test showed that the emissions where extremely clean. why would this car have so much water vapors when others just spit droplets of water out of the tail pipe. Is this a catalytic function or normal for this car and model.